My research interests are the systematics and conservation of Neotropical amphibians and reptiles, and the ecological dimensions of biodiversity. For the first line of research, I work primarily in the Andes and the Amazon. I collaborate with colleagues in museums and other research institutions in describing new species and developing phylogenies of frogs from the mega-diverse eastern slopes of the Andes. I am interested in using phylogenies as a road map to compare and contrast physiological traits among species, As part of these investigations, my collaborators and I are studying thermal preferences, tolerance to heat, and the influence of temperature on physiological functions, in order to understand how climate warming will affect these animals. Finally, a major theme of my current research is exploring the effects of fungal disease on the ecology of amphibians, a group that is experiencing staggering biodiversity losses worldwide. After documenting the collapse of a species-rich amphibian assemblage, I am interested in developing strategies to mitigate the impact of the fungal disease chytridiomycosis on surviving species. I'm an Amphibian Red List Authority and an Associated Researcher with CORBIDI. I hail from the land of Dunkin Donuts and traffic circles, the greatest state in the Union, Connecticut (sorry David). I recently finished my Masters in Environmental Science from the Yale School of Forestry and Environmental Studies examining the effect of urbanization on amphibian populations (w/ David Skelly). Prior to that I worked on oviposition site choice in gray tree frogs at the University of Connecticut (w/ Mark Urban). Since 2008 I’ve been working in Costa Rica with the Forman School Rainforest Project, a high school group focusing on biological monitoring. At FIU i’m excited to return to the Neotropics to work on my PhD. I’ll be studying amphibian community composition and rebounding populations in Bd enzootic areas. I’ll be focusing on the dynamics and genetic structure of rebounding populations, causes for rebounds and overall community structure changes since the declines began. For more info on my current or past research check out my website! I come from the original land of Dunkin Donuts, the state Connecticut wishes it was: Massachusetts (Sorry Alex). Last year I finished my Master’s degree in Biology at Western Kentucky University and my thesis was focused on the effects of mining on pond breeding salamanders as part of the Johnson Lab. I received my Bachelor’s degree from Gettysburg college where I worked in the Kerney lab on characterizing the skin microbiome of red-backed salamanders in relation to their resistance to chytridiomycosis. During my time in the Catenazzi lab my research will be focused on the effects of biodiversity and abiotic filtering on the prevalence of Bd. I hope to determine drivers of Bd distribution across the landscape that will provide important insight for future conservation efforts in landscapes with chytridiomycosis. My additional research interests include conservation, disease ecology, genetics, and symbiotic relationships. I hail from the land of chicken wings and seasonal depression, the intellectual nucleus of the United States: Buffalo, New York. In 2014, I moved from sumptuous Buffalo to St. Petersburg, Florida where I obtained my B.S in biology from Eckerd College. I now am a second semester master’s student in the lab. During my time in the Catenazzi lab, I will be working with the critically endangered Florida Grasshopper Sparrow, specifically, researching the disease aspects of their recovery program. Read more about sparrow research here. I attended SUNY Oswego for my undergraduate, obtaining a Bachelor of Science in Zoology. My ultimate goal is to utilize the knowledge I receive throughout my education and carry out research projects that will contribute to the conservation and management of endangered species. I am especially interested in the conservation of Neotropical amphibians. At Southern Illinois university, I aspire to better understand the effects that chytridiomycosis has had and continues to have on amphibians. I am also interest in how ecosystems are altered due to the reduction of amphibian diversity. I am hoping that my research here will pave way in developing adequate conservation plans that will help conserve and reduce the loss of amphibian diversity. ​I hail from the northernmost, westernmost, easternmost, largest, and greatest state in America, Alaska. In 2014 I moved to Miami for taekwondo and am currently a senior at FIU perusing a B.S in Biology, following a pre-med track. It is my second semester as an undergraduate researcher in the Catenazzi lab, where I have primarily been acting as a research assistant and helping Alex and Dr. Catenazzi with their amphibian research on Bd and Enrico with his salmonella infection on freshwater turtles. I hope to carry out future research examining the immunological effects of different peptides produced by frogs in combating Bd, using CRISPR gene editing technology.. I come from North Carolina, home of everything great and wonderful from Krispy Kreme donuts to the world's highest salamander diversity. Luckily it was the latter, not the former, that caught my interest during my formative years and inspired my passion for nature, particularly, herpetology. I received my B.S. in Biological Sciences from N.C. State University. Following my graduation, I pursued varied dreams by conducting field work in both the southeast and South America in between touring the United States in a rock and roll band. My interests in both herpetology and conservation channeled my pursuits towards studying chytridiomycosis, eventually leading me to the Catenazzi lab at SIU. Here I have focused my efforts on the natural methods that make frogs resistant to the disease and how these can be applied towards mitigation strategies. In particular, I am investigating why two closely related species of marsupial frog differ in their response to chytridiomycosis - one is resistant and one susceptible. Using analytical techniques like mass spectrometry and next generation DNA sequencing, I identified the compositions of each species' antimicrobial peptides and cutaneous bacterial symbionts, two amphibian defense mechanisms that have been linked to chytridiomycosis resistance. I am from a small town north of New York City in the beautiful Catskill Mountains. I attended SUNY Oswego for my undergraduate and graduated in 2012 with a BS in Zoology and a minor in Chemistry. I enjoy researching amphibians and turtle conservation. I am now a Master’s student in the Catenazzi Lab at SIUC working on amphibian decline in Peru caused by the pathogenic chytrid fungus, Bd. The research I conduct focuses on community effects and species roles in the transmission of Bd. 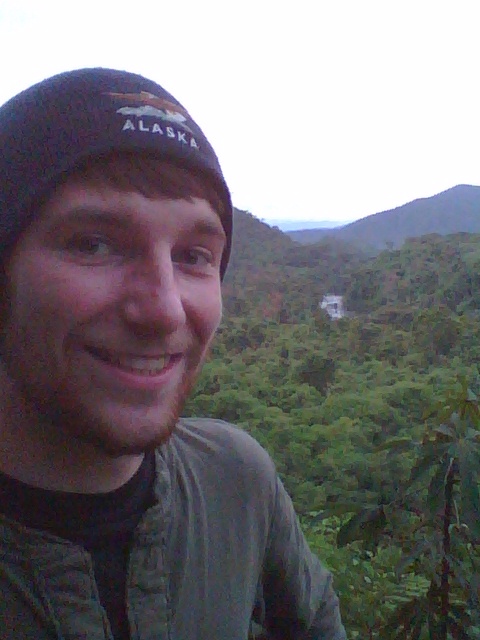 Chris is an undergraduate student at SIUC and he investigates the taxonomy of an enigmatic Andean snake. 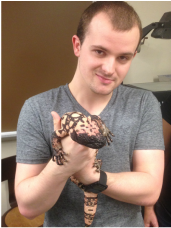 He is the president of the SIU Herpetology Club (SIU Herpetology Enthusiasts of Southern Illinois, of which David Burkart was first president and co-founder). I am from Lindenhurst, Illinois and I am pursuing a BS in Zoology, Wildlife Biology track. I have been involved with research on recent amphibian declines due to chytridiomycosis infection using quantitative PCR. I'm interested in the ecology and management of mammals. Joseph has conducted research in the lab investigating symbiotic skin bacteria in frogs. Specifically, he has assisted with 16S sequencing and identification of bacterial strains from DNA extracted from skin swabs of tropical frogs. I'm a senior in the animal biology track for zoology. As an undergraduate assistant in the lab, I have been involved in a variety of projects including preparing samples for stable isotope ratio mass spectrometry, PCR and real time PCR, and peptide quantification. I am a third year student pursuing a bachelor’s degree in zoology with a specialization in wildlife biology and conservation and a minor in environmental studies. Currently, I serve as a volunteer undergraduate assistant, aiding in PCR processing and other ongoing projects. In the future, I plan on seeking a career in wildlife conservation. 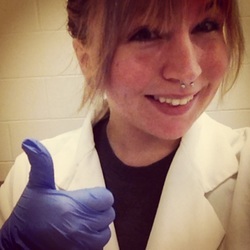 I am a junior majoring in zoology, and I hope to go to veterinary school when I graduate. In veterinary school, I hope to specialize mainly in reptiles. In my free time I like to play guitar and ukelele, play video games, and spend time outside. While working in lab, I prepare plates for PCR and microBCA, as well as enter data. ​I am a freshman and a Physiology major on the Pre-Medicine track. In the past, I was involved with the IJAS Science Fair, and I researched the effects of spices on the growth if E. coli. I love going to new places and taking pictures throughout my travels, and I one day hope to visit all 50 states. In the lab you can find me preparing plates for PCR. 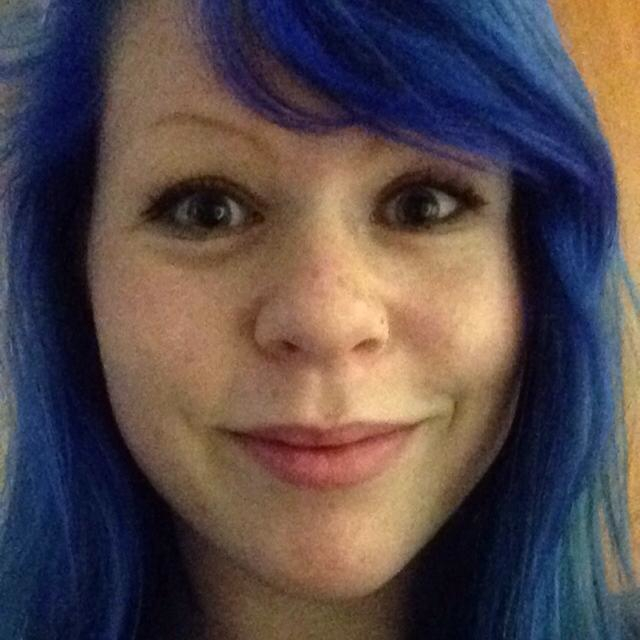 I am a freshman hailing from Carbondale pursuing my degree in zoology and a minor in environmental studies. I hope that when I finish with school, I am able to pursue a career in park and recreation management. I enjoy being in nature, taking photographs, and playing basketball. While working in the lab I am normally preparing plates for PCR. I'm a junior in the animal biology track for zoology. My favorite animal is the polar bear,Ursus maritimus. As an undergraduate assistant in the lab, I have been involved in a variety of projects including preparing samples for stable isotope ratio mass spectrometry, PCR and real time PCR, and peptide quantification. I am also starting to work on a collaborative project between the Catenazzi and Fisher labs involving mammalian cell tissue cultures and toxicity assays. 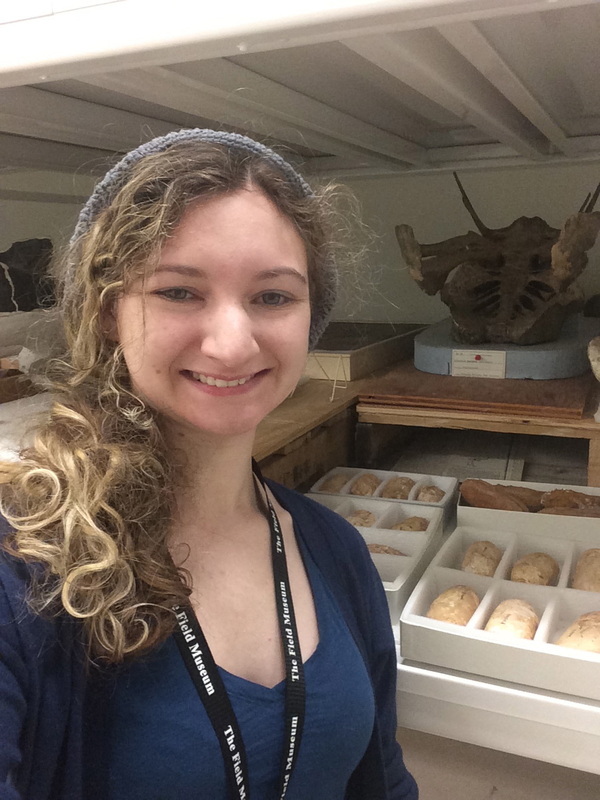 I am currently a second year student working towards a Science Degree in Zoology with a specialization in Wildlife Biology and Conservation and a minor in Environmental Studies. It should not be a surprise that wildlife conservation is a field I find particularly interesting and hope to pursue in the future through graduate studies. As an undergraduate assistant, I mainly aid in prepping Bd swab samples for PCR. Also, I have helped with David Burkart's microBCA assay for his graduate work and inputted the Peruvian sample data in a spreadsheet. I'm a volunteer undergraduate assistant. I assist with PCR analysis and any other areas where help is needed in the lab. I major in zoology and would like to pursue a career in conservation. I am a sophomore majoring in zoology, and I hope to go to veterinary school when I graduate. In veterinary school, I hope to specialize mainly in reptiles. In my free time I like to play guitar and ukelele, play video games, and spend time outside. While working in lab, I prepare plates for PCR and microBCA, as well as enter data.